Objectives The aims of this study were to assess malnutrition risk in Chinese geriatric inpatients using Nutritional Risk Screening 2002 (NRS2002) and Mini-Nutritional Assessment (MNA), and to identify the most appropriate nutritional screening tool for these patients. Setting Eight medical centres in Hubei Province, China. Participants A total of 425 inpatients aged ≥70 years were consecutively recruited between December 2014 and May 2016. Primary and secondary outcome measures Nutritional risk was assessed using NRS2002, MNA, anthropometric measurements and biochemical parameters within 24 hours of admission. Comorbidities and length of hospitalisation were recorded. Nutritional parameters, body mass index (BMI) and length of hospital stay (LOS) were employed to compare MNA and NRS2002. Kappa analysis was used to evaluate the consistency of the two tools. Results The average age was 81.2±5.9 years (range, 70–98). The prevalence of undernutrition classified by NRS2002 and MNA was 40.9% and 58.6%, respectively. Patients undergoing malnutrition had lower BMI, haemoglobin, albumin and prealbumin (p<0.05), and longer LOS (p<0.05). The NRS2002 showed moderate agreement (κ=0.521, p<0.001) with MNA. Both tools presented significant correlation with age, BMI and laboratory parameters (p<0.001). In addition, a significant association between both tools and LOS was found (p<0.05). In addition, the NRS2002 was not different from MNA in predicting nutritional risk in terms of the area under the receiver operating characteristic curve (p>0.05). Conclusions The results show a relatively high prevalence of malnutrition risk in our sample cohort. We found that NRS2002 and MNA were both suitable in screening malnutrition risk among Chinese geriatric inpatients. This study assessed the risk of malnutrition among Chinese elderly inpatients using two different tools (Nutritional Risk Screening 2002 and Mini-Nutritional Assessment [MNA]). The study provides useful information to assess the risk of malnutrition among Chinese elderly inpatients. The consensus statement with diagnostic criteria for malnutrition was proposed in 2015 after initiation of our study and thus was not used in our study. With regard to the cross-classification of MNA, more patients will be categorised as at risk since the two groups of malnourished and at-risk patients are combined. In addition to nutritional status, length of stay could also be influenced by age, financial situation, comorbidities and so on, which may explain the low R2 during the simple linear regression analysis. Malnutrition is a common condition affecting almost 13%–78% of the elderly population.1 It is highly associated with numerous adverse outcomes, including frailty,2 muscle wasting,3 weakened immune system,4 longer hospitalisation,5 and increased morbidity6 and mortality.7 8 These outcomes contribute to large increases in medical expenditures.9 Early identification and treatment of malnutrition can lead to better quality of life10 and improved outcomes11 in older inpatients. Therefore, it is essential that appropriate tools are applied when assessing the risk of malnutrition in geriatric patients. Nutritional risk screening and nutritional assessment tools are readily available nowadays.12 These tools are used to identify patients with nutritional risk or nutritional deficiencies and to determine if intervention is needed. There are a variety of nutritional risk screening methods,13 mainly involving anthropometric and biochemical parameters. However, to date, no single tool has been considered as the universal gold standard for the assessment of nutritional risk among older inpatients. The Nutritional Risk Screening 2002 (NRS2002) is recommended for hospitalised patients by the European Society of Parenteral and Enteral Nutrition (ESPEN).14 It can quickly determine whether a patient needs nutritional support, especially those with acute complications.15 16 However, the use of NRS2002 excludes patients who cannot be weighed or have problems with communication, and the tool is not specifically developed for older patients. The Mini-Nutritional Assessment (MNA) is established for nutritional screening and assessment in the geriatrics settings.1 17 The ESPEN recommends using this tool for elderly populations.18 The MNA was validated against a clinical evaluation of two geriatrics, including biochemical parameters (nutritional parameters, C reactive protein, cholesterol, vitamins), anthropometry (body mass index [BMI], brachial circumference, calf circumference, skinfold width of the triceps and subscapular muscles), dietary components and functional assessment outcomes.19 It has been shown to predict outcomes, functional status, mortality, number of hospital visits and the related healthcare costs.18 20–23 In comparison with the NRS2002, the MNA is more time-consuming.24 Hence, two short forms of the MNA have been developed and validated, the most recent being the revised Mini-Nutritional Assessment-Short Form by Kaiser et al,25 which is currently the recommended version of the MNA for clinical use. This instrument only incorporates 6 of the original 18 items and takes approximately 5 min to perform. Although a number of studies suggested that serum proteins are associated with malnutrition, the nature of this association is controversial.26–28 In addition, haemoglobin and total lymphocyte count were also proposed as useful indicators of nutritional status.27 29 The aim of our study was to assess the risk of malnutrition among Chinese older participants using two different tools (NRS2002 and MNA), to compare them in terms of nutritional biochemical parameters and length of hospital stay (LOS), and to determine the most appropriate tool for these patients. We hypothesised that both tools were suitable for the study population. This study consecutively recruited patients older than 70 years of age who attended the internal medicine of the geriatrics department of eight large-sized, tertiary comprehensive hospitals in Hubei Province from December 2014 to May 2016. The eight hospitals are as follows: (1) Tongji Hospital, Tongji Medical College, Huazhong University of Science and Technology; (2) The Central Hospital of Wuhan University; (3) Zhongnan Hospital of Wuhan University; (4) Wuhan No 6 Hospital, Affiliated Hospital of Jianghan University; (5) Hubei General Hospital; (6) General Hospital of The Yangtze River Shipping; (7) Wuhan No 1 Hospital; and (8) The First College of Clinical Medical Science, Three Gorges University and Yichang Central People’s Hospital. The following were the inclusion criteria: (1) age 70 years or older, (2) the patients themselves or their proxies could clearly answer the study questions, (3) hospital stay was longer than 24 hours, and (4) patients were willing to cooperate with the study. 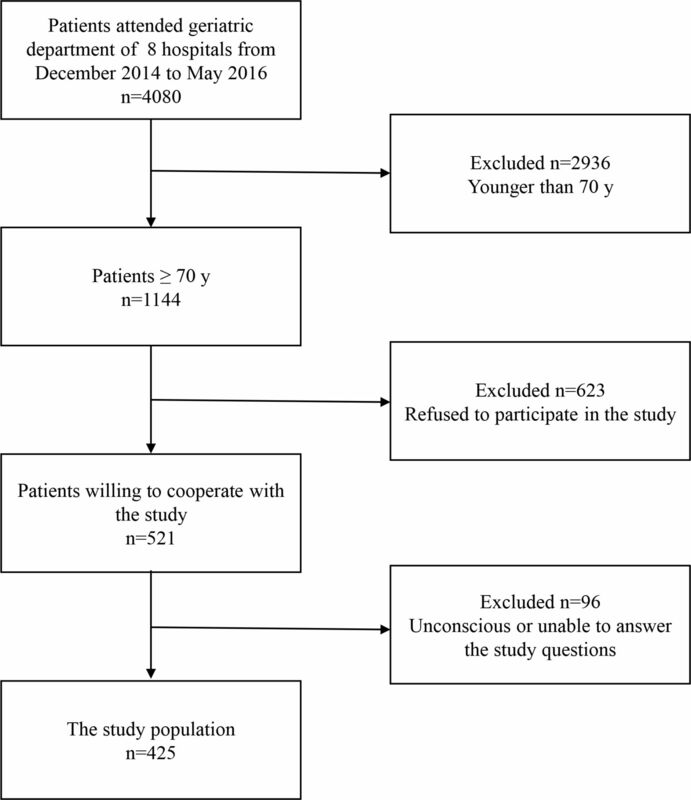 The exclusion criteria included (1) younger than 70 years old, (2) refusal to participate in the study and (3) unconscious or unable to answer the study questions (figure 1). Flow diagram of participant inclusion and exclusion. Each hospital had two researchers trained before the start of the study. The main content was on how to interpret the questions in the instruments (MNA and NRS2002) and how to perform the measurements. Patients were evaluated using both MNA and NRS2002 by two trained researchers on the first day of admission or early morning of the next day. Comorbidities and length of hospitalisation were obtained from medical records. Patients were diagnosed by their bedside clinician and superior clinicians. Two trained researchers of each hospital verified the diagnoses and acquired the data. Both body height and weight were measured at 06:00–08:00 within 24 hours after admission. Patients were asked to fast, to only wear ward clothes and to take off shoes before measurement. Height was measured with a calibrated scale (corrected to ±0.5 cm). The actual body mass was measured with a calibrated scale (corrected to ±0.2 kg). BMI was calculated as weight/height squared (kg/m2). Blood samples were also obtained within 24 hours after admission. Nutritional biochemical parameters including serum haemoglobin (Hb), total lymphocyte count (TLC), albumin (ALB) and prealbumin (PAB) were examined in the hospital’s clinical chemistry laboratory. Malnutrition was determined when the value of Hb was <120 g/L for men and <110 g/L for women. The cut-off value for ALB was 35 g/L (normal range 35–55 g/L), for PAB was 200 mg/L (normal range 200–400 mg/L) and for TLC was 1.1×109/L (normal range 1.1–3.2×109/L) for both genders for malnutrition.34 Moreover, based on previous research,29 the cut-off value for BMI was set at 20.5 kg/m2 for malnutrition. Patients did not participate in the design and conception of the proposed study. No patients were asked to advise on the interpretation or writing up of the results. The results of the measurements would be disseminated to the participants immediately after the investigation. Statistical analyses were conducted using SPSS V.19.0. Data were presented as mean±SD with ranges in bracket. The χ2 test or Student’s t-test was used according to data type. One-way analysis of variance was applied for multigroup comparisons, and correlation analysis was qualified using the Pearson correlation test. The simple linear regression analysis was used to estimate the relationship between both instruments (MNA and NRS2002) and LOS. Agreement between the two screening tools was determined using the kappa (κ) statistic. The results were interpreted as follows: <0, no agreement; 0–0.19, poor concordance; 0.20–0.39, fair agreement; 0.40–0.59, moderate agreement; 0.60–0.79, substantial agreement; and 0.80–1.00, almost perfect agreement.29 In addition, the receiver operating characteristic (ROC) curve was applied to compare MNA and NRS2002 separately with nutritional parameters using MedCalc V.18.6. The level of significance was set at p<0.05. Over the study period, a total of 425 individuals from the department of geriatrics of eight hospitals in Hubei Province met the eligibility criteria and completed a nutritional assessment within 24 hours of admission (figure 1). The average age was 81.2±5.9 years (range, 70–98) and 31.1% were female. The average BMI was 23.2±3.7 kg/m2 (range, 11.1–34.1). The average length of hospitalisation was 21.9±13.8 days (range, 4–133). The most frequent cause of hospitalisation was cardiac disease, followed by pulmonary infection, hypertension, cerebrovascular diseases, digestive disease and malignancies. However, the most frequent comorbidities were hypertension, diabetes mellitus, cardiac disease and cerebrovascular disease. The characteristics of study participants are shown in table 1. According to the NRS2002, approximately 174 patients (40.9%) were undernourished and 251 patients (59.1%) had normal nutritional status. The MNA demonstrated that 99 patients (23.3%) were malnourished, 150 patients (35.3%) were at risk of malnutrition and 176 patients (41.4%) had normal nutritional status. Table 2 shows the risk of undernutrition, varying from 23.7% to 58.6%, according to the different methods employed in the current work. The risk of undernourished participants classified by NRS2002, MNA, BMI, ALB, PAB and TLC was 40.9%, 58.6%, 23.7%, 28.7%, 47.3% and 35.9%, respectively. The risk of malnutrition was higher in men than that in women according to Hb (41.7% vs 25.6%, respectively). Although both instruments were closely related to each other (p<0.001), they showed substantial differences. Table 3 shows the cross-classification of MNA and NRS2002 with regard to two nutritional categories. The MNA classified more patients as undernourished than the NRS2002 (249 vs 174, respectively). Among the 249 patients classified as undernourished by the MNA, the NRS2002 coincidently categorised 159 as malnourished and 90 as well nourished. The NRS2002, on the other hand, classified 174 patients as undernourished. Within this group of participants, the MNA classified 159 patients as undernourished and 15 as well nourished. Moreover, a participant considered by the MNA to be well nourished can be classified as undernourished using the NRS2002. The individual categorisation of nutritional status presented moderate agreement between MNA and NRS2002 (κ=0.521, p<0.001). Data on Hb, TLC, ALB and PAB concentrations are listed in table 2 and online supplementary table 1. There existed a significant decrease in ALB, PAB, Hb and TLC in the three groups of MNA scores (p<0.001 and p=0.023; figure 2A). Specifically, the group with the lowest MNA score (<17) (n=99), indicating poor nutritional state, had an average serum ALB of 33.3±4.8 g/L (range, 22.8–43.2), an average PAB of 140.8±81.7 mg/L (range, 12–339) and an average Hb of 109.0±20.8 g/L (range, 57–150.2), as well as an average lymphocyte count of 1.5±1.2×109/L (range, 0.3–6.6). With regard to the risk of the malnutrition group with an MNA score of 17–23.5 (n=150), the average serum ALB was 37.9±5.6 g/L (range, 21.6–70), the average PAB was 192.3±61.8 mg/L (range, 8–380), the average Hb was 120.2±22.0 g/L (range, 55–181) and the average lymphocyte count was 1.3±0.56×109/L (range, 0.2–2.9). The group with MNA score ≥24 (n=180) had an average serum ALB concentration of 39.8±3.8 g/L (range, 29.3–54), an average PAB of 216.7±54.4 mg/L (range, 25–337), an average Hb of 127.6±15.3 g/L (range, 81–173) and an average lymphocyte count of 1.5±0.7×109/L (range, 0.3–4.3) (figure 2A and online supplementary table 1). (A) Mini-Nutritional Assessment (MNA) and (B) Nutritional Risk Screening 2002 (NRS2002) referring to serum albumin, prealbumin, haemoglobin and blood lymphocytes count, respectively. Similarly, ALB, PAB and Hb gradually declined with increasing risk of malnutrition according to the NRS2002 results (p<0.001; figure 2B). In undernourished patients (NRS2002: 3–7, n=174), the average serum ALB was 35.1±5.6 g/L (range, 21.6–50.2), the average PAB was 148.5±79.3 mg/L (range, 17–339) and the average haemoglobin was 113.3±23.6 g/L (range, 55–181). In the normal nutritional state group (NRS2002: 0–2, n=251), the results were as follows: ALB 39.4±4.5 g/L (range, 26.4–70), PAB 210.2±56.1 mg/L (range, 8–380) and Hb 125.8±16.2 g/L (range, 72–173). 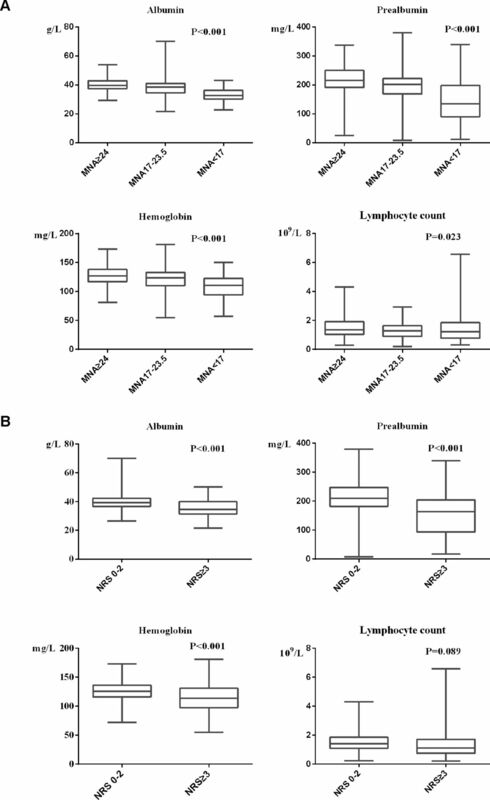 By contrast, no difference in lymphocyte count was found in both groups (p=0.089; figure 2B and online supplementary table 1). Table 4 shows the Pearson correlation coefficients of MNA and NRS2002 scores with BMI, serum parameters and LOS. BMI, Hb, ALB and PAB correlated negatively with malnutrition scores of NRS2002, while they showed positive correlation with the MNA scores (p<0.001). There existed an inverse correlation between age and the two tools (p<0.001). In addition, a significant association between both tools and LOS was demonstrated (p<0.05). No correlation was found between TLC and the two tools. Table 5 shows the simple linear regression of LOS. There was a linear correlation between the MNA scores and LOS (p<0.05) and so with the NRS2002 scores (p<0.01). Figure 3 shows the ROC curve analysis of the sensitivities and specificities of MNA and NRS2002 in predicting nutritional risk. The comparison between MNA and NRS2002 in those patients revealed the area under the ROC curve (AUC) values for MNA (0.794, ALB; 0.704, PAB; 0.702, Hb; 0.581, TLC) and NRS2002 (0.761, ALB; 0.616, PAB; 0.677, Hb; 0.586, TLC). In addition, the comparison between the AUC showed that NRS2002 was not different from MNA in predicting nutritional risk (p=0.191, ALB; p=0.063, PAB; p=0.299, Hb; p=0.866, TLC). Receiver operating characteristics of sensitivity and specificity of predicted probabilities for nutritional risk incorporating the Mini-Nutritional Assessment (MNA) score or the Nutritional Risk Screening 2002 (NRS2002) score. Based on the current study, the nutritional health of older inpatients was assessed using NRS2002, MNA, BMI, Hb, TLC, ALB and PAB. The results showed that the overall prevalence of malnutrition risk for the enrolled older patients ranged from 23.7% to 58.6%. The highest prevalence of malnutrition risk was detected by MNA and the lowest by BMI. These results illustrated the differences in nutritional risk detected by different screening tools. Biochemical markers possess many advantages in the assessment of nutritional status, such as fast application and low cost. In addition, they can be incorporated into the routine clinical application. As the most abundant plasmatic protein, ALB is commonly used in the assessment of malnutrition.35 In several studies, low serum ALB correlated with longer hospitalisation, medical complications and increased mortality.35–37 Nevertheless, its value is still limited by its long half-life (14–20 days), associated inflammation and impairment of hepatic or renal function, and possibly ageing itself.27 Due to the reasons above, the prevalence of malnutrition detected by ALB is lower than MNA and NRS2002 in our study. Comparatively, a study by Covinsky et al 38 showed ALB is highly sensitive yet low specific in the diagnosis of malnutrition in hospitalised older adults. Our study revealed that NRS2002 and MNA, in moderate agreement with each other, were consistently associated with age, BMI, Hb, ALB and PAB. Nevertheless, the MNA identified more patients with or at risk of malnutrition than the NRS2002 did. The lower percentage of malnutrition classified by NRS2002 may be explained in several ways. First, the NRS2002 mainly considers the influence of acute diseases on nutritional status, while the MNA takes chronic long-term condition into consideration, such as psychological factors and BMI. Psychological factors may play a large role in the nutritional status of older inpatients. In addition, we categorised undernutrition as NRS2002 ≥3, while a score of 1–2 indicates low risk of malnutrition.51 This may have underestimated the percentage of malnutrition. Moreover, our study subjects were internal medicine patients, among which the proportion of overweight and obesity was high. The NRS2002 takes BMI <18.5 kg/m2 as one of the criteria, leading to a lower proportion of malnutrition with NRS2002 than that of MNA. Our results agree with the findings from Raslan et al, 5 yet differ from the study conducted by Drescher et al.51 The latter study was conducted in older patients with acute disease, which may explain the difference. Norman et al 52 suggested that there exists a close relationship between the degree of malnutrition and LOS. In the present study, we found a linear relation between both instruments (MNA and NRS2002) and LOS. Our findings corroborated those of the study conducted by Bauer et al, 53 showing longer hospital stay was associated with malnutrition assessed by the MNA. 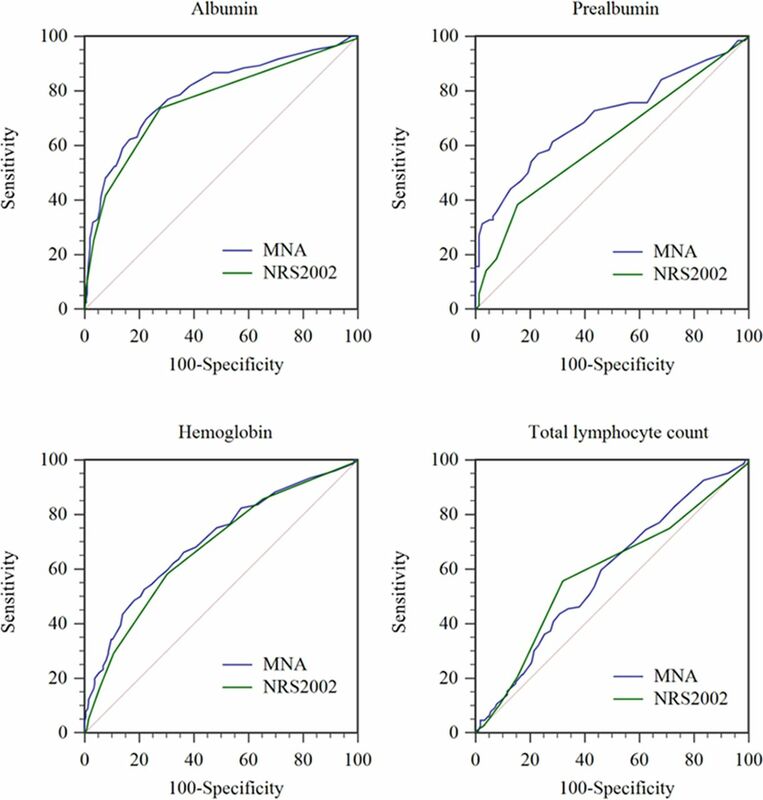 Comparison of the MNA and NRS2002 and their ability to predict nutritional risk according to different standards showed that these tools were both suitable as a screening tool, in terms of the ROC curve area. Therefore, we conclude that in Chinese geriatric inpatients the NRS2002 and MNA might reflect malnutrition or the studied biochemical parameters, as well as predict the length of hospitalisation. However, the MNA was available for identifying most of the patients with or at risk of malnutrition. Our study still has some limitations. First, a consensus statement with diagnostic criteria for malnutrition was proposed in 201554 after our study was initiated and thus was not used in this study. Second, BMI and age were part of the screening tools, therefore already correlated with the MNA and NRS2002 assessment. In addition to nutritional status, LOS could also be influenced by age, financial situation, comorbidities and so on, which may explain the low R2 between both instruments and LOS. Finally, regarding the cross-classification of MNA, more patients will be categorised as at risk since the two groups of malnourished and at-risk patients are combined, which may contribute to the low kappa value between the two instruments. To conclude, the results of the present study show a high prevalence of malnutrition risk in Chinese geriatric hospitalised patients. Although the nutritional risk varied depending on the applied method, both NRS2002 and MNA correlated with each other and with age, BMI and laboratory parameters. In addition, both tools proved to be a good predictor of the length of hospitalisation. Moreover, the NRS2002 was not different from MNA in predicting nutritional risk according to the AUC. Therefore, this study suggested NRS2002 and MNA were both suitable for screening malnutrition risk among Chinese geriatric inpatients. We recommend using one of them on admission. We appreciate the participating volunteer patients, the local research ethics committee, and the individual researchers, clinicians and nurses for their participation in the data collection.
. The Mini Nutritional Assessment (MNA) review of the literature–What does it tell us? J Nutr Health Aging 2006;10:466–85. Discussion 485-7.
. [Screening of nutritional status among elderly people at family medicine]. Acta Med Croatica 2015;69:347–56.
. Reliability of the mini nutritional assessment (MNA) in institutionalized elderly people. J Nutr Health Aging 2002;6:134–7.
. The Mini Nutritional Assessment (MNA) for grading the nutritional state of elderly patients: presentation of the MNA, history and validation. Nestle Nutr Workshop Ser Clin Perform Programme 1999;1:3–11. J-PM and X-QQ contributed equally. Contributors J-PM, X-QQ and H-LZ are the main contributors to the design of the present study. J-PM and X-QQ contributed to the study conception and design. H-LZ and C-TZ took part in the discussion and modification of the study design. HZ, MY, L-YS, Q-HG, G-YZ, Q-JM, Y-XW and S-GL contributed to the study conception. X-QQ, HZ, MY, L-YS, Q-HG, G-YZ, Q-JM, Y-XW and S-GL were involved in the acquisition of data. J-PM and X-QQ made contributions to the drafting of the manuscript. H-LZ and C-TZ were involved in the critical revision. All the authors were involved in the analysis and interpretation of the data and gave their final approval. Funding This project was funded by the National Natural Science Foundation of China (Grant No 81400255). Ethics approval This cross-sectional study received approval from the institutional ethics committee (Ethics Review Board of Tongji Hospital, Tongji Medical College, Huazhong University of Science and Technology [TJ-C20141112]), and all subjects signed written informed consent before participation.